Roy Hodgson is confident Aaron Wan-Bissaka will remain at Crystal Palace next season. 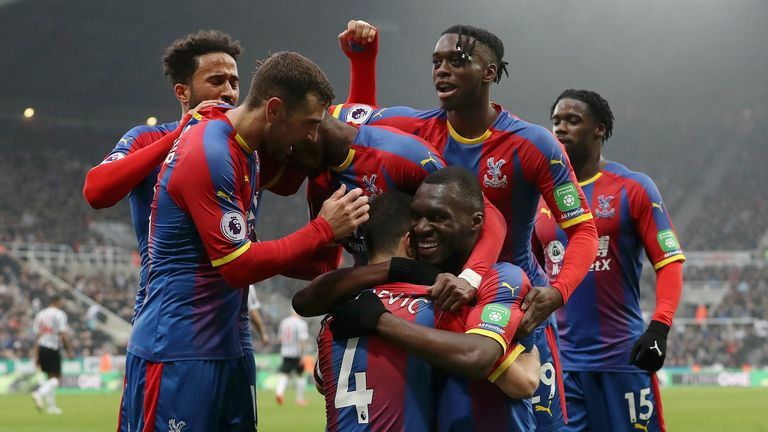 The 21-year-old has emerged as a key player for Palace this season, starting 29 of their 33 Premier League games, while chipping in with two assists. That form has brought him to the attention of some of Europe's top clubs and Sky Sports News understands both Borussia Dortmund and Bayern Munich are showing an interest in Wan-Bissaka, as well as Palace team-mate Wilfried Zaha. Hodgson believes Wan-Bissaka has "an incredible future" and is not surprised the right-back is attracting interest. "It is always hard to say whether a player would have their head turned by speculation of that type," Hodgson said, speaking after Saturday's 1-0 over Newcastle at St James' Park. Highlights from Crystal Palace's 1-0 win against Newcastle in the Premier League. "I don't believe that an offer has been made and I think this is still speculation. "I can't say that I am surprised [about reported interest], I think he is playing so well and he has an incredible future in front of him. "I can't say that I am surprised [about reported interest], I think he is playing so well and he has an incredible future in front of him." "And I've not seen anything in his performances, or heard anything that causes me to change my mind or have any doubts that he is going to be our player. "But if that speculation comes to pass and an offer comes to the table, then it will be up to the club to make a decision I suppose. "But at the moment, I don't have any concerns in that respect."